I did a reasonable amount of travelling when I was younger, including a 3 week driving tour of Europe in my teens, a holiday to Thailand for Millennium Eve, and getting married in Mexico! Then travel took a back foot when the boys came along, but over the last few years my feet have been getting itchier. And testing my knowledge on the Karcher Monuments of the World quiz has just made me want to travel even more! This year I’ve been fortunate to have two trips abroad, including our family summer holiday in Portugal and a lovely weekend in Dublin last month. So I’ve been giving some thought to where I’d like to go next year, and I’ve come up with a short wishlist. Some of them are achievable, but some of them are probably just a dream – unless we win the lottery! This is the gorgeous little Portuguese village where we have spent our family holidays over the last few years. I shouldn’t really be telling you about it, I don’t want it to get too busy! But in all seriousness, it’s a beautiful place to stay with a gorgeous beach, friendly people and lovely restaurants. I really hope we go back again next year. I’ve visited this city in Southern Spain a couple of times before, and it is a perfect location for a relaxed weekend. The heat gets a bit too much for me in the summer – it was 41C at 6pm the last time we visited! My favourite time to visit Seville is in the Spring, when the air is full of the scent of orange blossom. And if you can time your visit to coincide with Easter, then the orange blossom mixes with the scent of incense from the Cathedral. It’s an amazing experience! I’m hoping that we might make it over there in March/April to celebrate Mark’s birthday. I’ve been fascinated by Berlin since the 1980s and the days of the Cold War. My brother was actually studying in the city when the Berlin Wall opened, and stood up on top of the Wall – that’s definitely a travel experience that I envy. 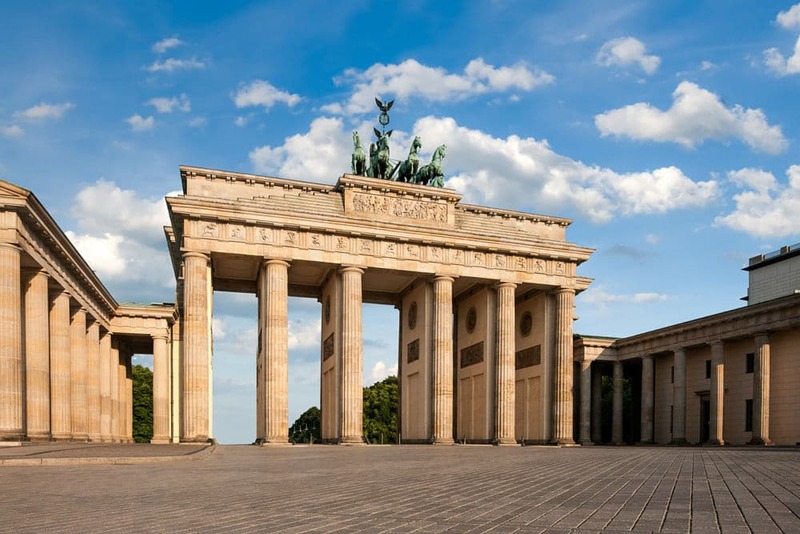 There’s a lot of history in Berlin, and of course it’s also a very cool destination. I’d love to head over there for a long weekend next year, but maybe this is one that I’d prefer to do without the kids! This is one destination that you might not have heard of! Kosice is a city in the East of Slovakia, and it’s somewhere that I’ve visited several times with Lyle. He used to train out there regularly before his tennis coach returned to the UK. Our visits then mainly consisted of eating, sleeping and training, so I’d love to go out there in the summer and explore the city properly. The cathedral of St Elizabeth in the centre of the city is a stunning piece of Gothic architecture! We’re into dream trip territory here. When Mark and I got married in Mexico, we flew back over New York at night. I was captivated by the lights of the city, and said to Mark that it’s a place I’d love to visit. That was 15 years ago next March, and we still haven’t been! There’s so much in New York that I’d love to see for myself, having seen all the sights on TV and film so often. My dream trip would be to go to New York for Christmas, and stay at the Plaza – yes, I’ve seen Home Alone 2 too many times! And for my ultimate dream trip for 2016, I’d love to visit Rio de Janeiro for the 2016 Olympic Games! I’ve always wanted to visit Rio to see the statue of Christ the Redeemer – it’s an iconic image that I’d love to see with my own eyes. But next year I reckon the city will be even more amazing than ever, when the Olympics are hosted there. Now that really would need a Lottery win! Why not have a go at the Karcher Monuments of the World quiz yourself, and let me know what your travel wishlist for 2016 looks like. Budapest is fantastic, that was one of the places I visited when we drove around Europe – although that was just after the fall of Communism and I’m sure it’s changed a lot since then! That’s a great list. I really must sort my passport out – I still haven’t updated it since I got married in 2011!!! That reminds me that mine needs to be renewed very soon – I can change my photo at last! I so need a holiday this year, some of these are places I’ve not been before. I would love to visit Burgau. I got traveling all out of me when I did the Nile but have to say is so many nice places. Beragu sounds like a beautiful place to visit full of sunshine, culture and history what more could you want? New York is AMAZING, I can’t stress how much of an utter dream it was. I still pinch myself! Both times were so wonderful, because there’s just so much to see! Ive always wanted to go to Rio de Janeiro. Its right on top of my list – Looks so beautiful… Will cost an arm and a leg I bet but Im sure it would totally be worth it. Thanks Charlotte – I’ve been wanting to visit Rio for years, I’m sure it’d be an amazing experience! Rio for the Olympics would be an absolute dream but I don’t think that’ll become a reality for me! I’d never heard of some of the European cities you mentioned so will have a quick google of those! Definitely a dream trip for me – unless I win the Lottery before then! Great list of places! I went to Berlin in the Winter and I loved it, I bet it’s even nicer in the summer! I’d love to go over in the run up to Christmas, but any time of year would work! Me too…If I win the lottery, I am definitely going travelling! Next year we have Portugal and Switzerland on our list of must visit and half a dozen other places on our list of would like to visit. I’ve added some places from your list onto mine as they sound intriguing. Ooh, Switzerland would be good as well – it’s a long time since I’ve been there! I’ve barely been anywhere and having three young children really puts me off but I do want to take them to Paris next year. It’s certainly easier travelling with the boys now that they are older. I think we waited til Lyle was 5 before we ventured overseas! It is never too early to start thinking about your next trips! There are some great places on here. Planning summer trips definitely helps me to get through the cold rainy November days! Exactly – here are so many places that I’ve seen on TV shows and films, I’d love to go and see them! New York is a real dream, not sure I’ll make it next year but I’d love to go! Enjoy your trip! It’s definitely easier to travel with the boys now that they’re a bit older! I would absolutely love to travel more, I can’t wait to be spontaneous and just up and go for long weekends abroad.